A Special Place In My Heart ! Description: For all that you do to make our relationship so special… you always have a special place in my heart. 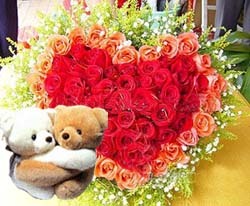 Product: Couple Bear w/ 36 red roses in a heart shape basket.